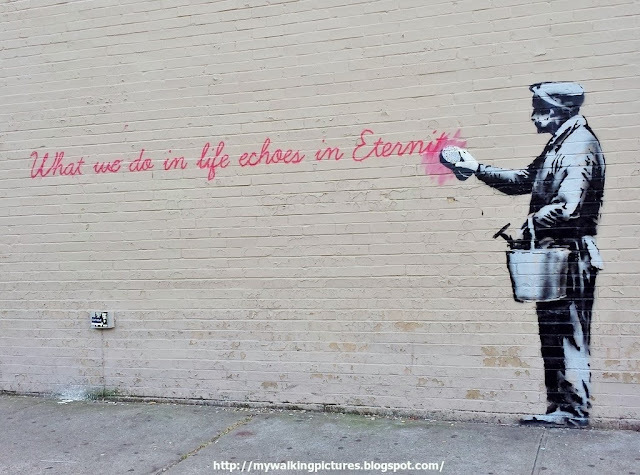 Last month, the elusive British street artist known as Banksy was all over New York City for a month long "residency". 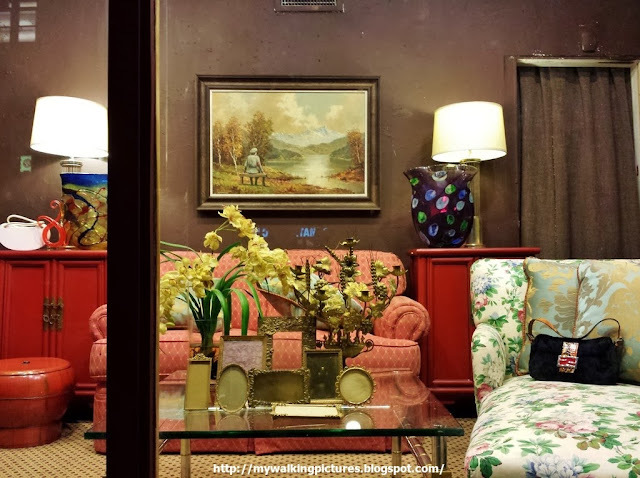 For each day during the month of October, he created a new installation on the streets, in trucks and even in cyberspace and announced the appearance of the new piece on his website and instagram account, which also included the general location of the piece. Banksy called his project Better Out Than In. 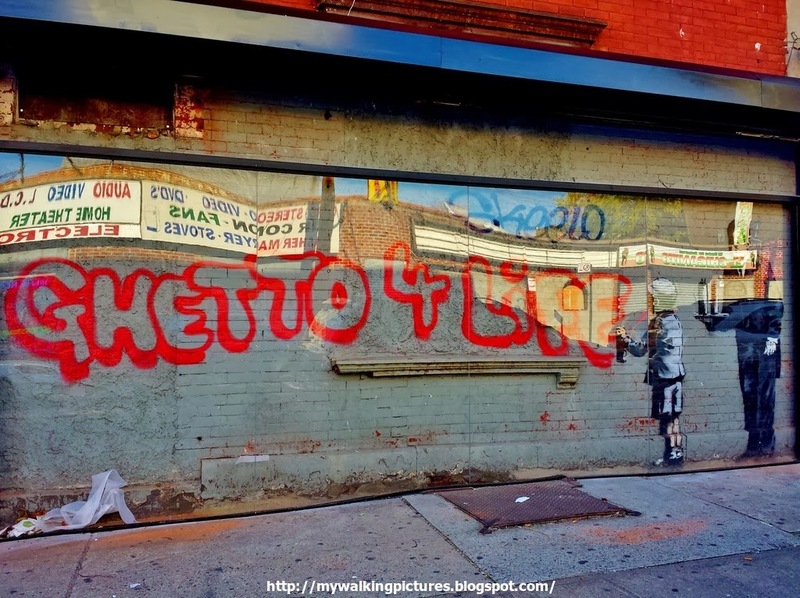 The header on his website included a hashtag, #banksyny, and a Paul Cézanne quote: "All pictures painted inside, in the studio, will never be as good as those done outside." 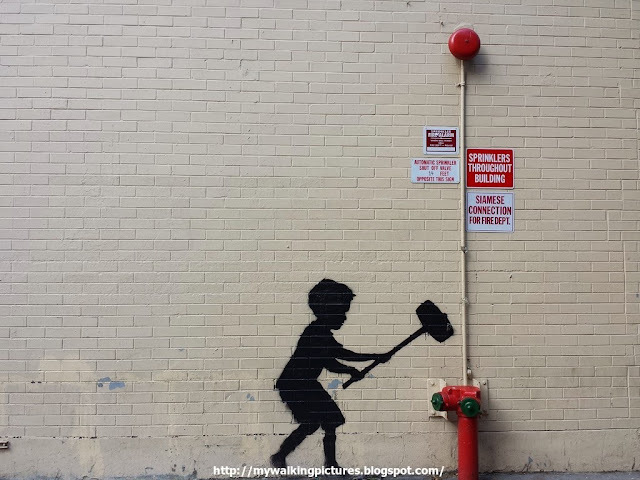 On October 1, Banksy's first work for the project showed up in Chinatown. He captioned this "the street is in play", it depicted a child reaching for a bottle of spray paint on a sign reading "Graffiti is a crime". The sign was stolen and later replaced by Queens-based graffiti group Smart Crew with a new sign that read "Street art is a crime". However, the following day, the stencil has already been painted over. Since most of my free times are during the weekends, the first Banksy piece I managed to take a picture of was his Day 3 work in midtown Manhattan. I took the pic two days after this was posted and there were already a lot of tags on the piece. At least, it hasn't been painted over yet. I didn't get the chance to take any picture of Banksy's works the following weekend as I was busy with Open House New York, and by the time I got the chance to go where the piece was, either it has been tagged, painted over or removed by the building owner. This article from Gothamist shows the project in chronological order so you'll know what I missed those first two weeks. I had better luck during the second half of the month. Day 14 was a man erasing the end of a quote from the movie Gladiator and was located in Woodside, Queens. As I was going in that area that day, I was able to take a pic before it was defaced later that night. Banksy also made a comment on his website after posting this piece. "Some people criticize me for using sources that are a bit low brow (this quote is from 'Gladiator') but you know what? "I'm just going to use that hostility to make me stronger, not weaker" as Kelly Rowland said on the X Factor." The following day, Day 15 was a 9/11 Tribute in Tribeca. The piece was on Staple Street and by the time I got there, a sizable crowd was busy taking pictures. Somebody even left a bouquet of flowers in front of the stencil art. Here's a larger view of the area, the wall of the building is also full of graffiti. Day 16 was a traveling Ronald McDonald statue, complete with a barefooted shoeshine boy. Banksy noted on his website that the sculpture will visit the sidewalk outside a different McDonalds every lunchtime for the next week. I never did get to see this. While a lot of Banky's fans were excited to see his daily work, some people have expressed strong disapproval at his graffiti tactics. And, unless a building owner files a complaint, the police wouldn't look for the elusive artist. This did not stop the New York Post from posting the headline “GET BANKSY!” on their October 17 edition. An accompanying story claimed police were “going all out” to find Banksy, and quoted unnamed law enforcement sources who said police wanted to arrest the artist and charge him with vandalism. 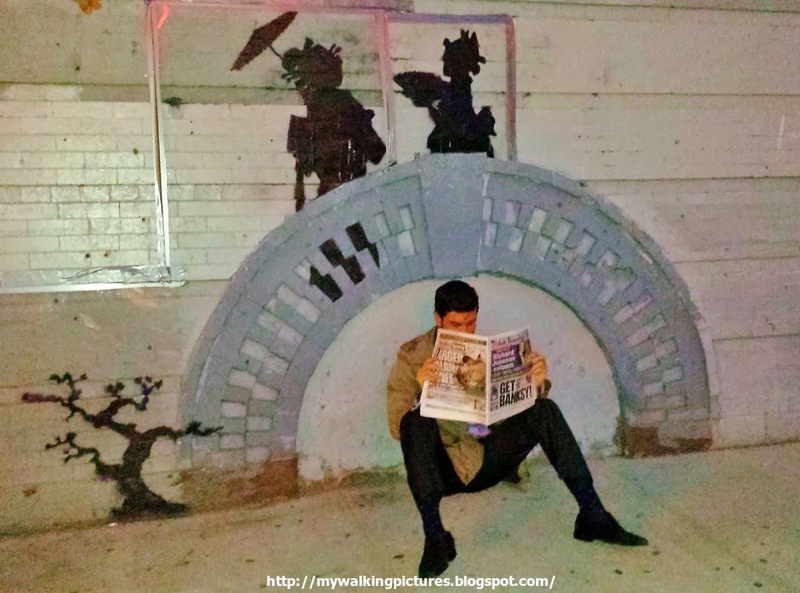 Banksy posted a copy of the newspaper on his website and the message: "I don't read what I believe in the papers." That New York Post edition made a great accessory to the Day 17 piece, which was located in Williamsburg. Many pointed out that the piece, two geishas and what seems to me was an ikebana plant, seems to be inspired by Kara Walker's work. By the time I arrived at the site, the geishas were already covered in plexiglass to protect it from being tagged or defaced, as somebody tried to do earlier. 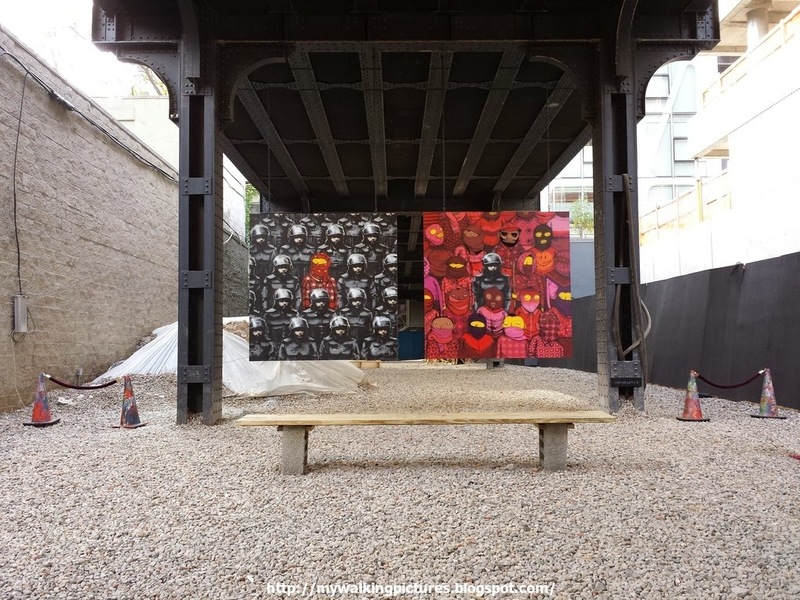 Friday, Day 18 was a collaboration with the Brazilian twins Os Gemeos and resulted to two paintings hanging underneath The High Line. It was noted on Banksy's website that the paintings were available for viewing until Sunday, right in time for my Saturday morning photo shoot at the park together with my fellow volunteer photographers. After our photo shoot, I went down to the street level to take a look at the two pieces. The paintings hanged side by side and were inside an enclosed area, complete with guards. At the time I took this pic, the gates were still closed to the public but there were already a lot of people taking pictures. Here's a closer pic of the canvasses. 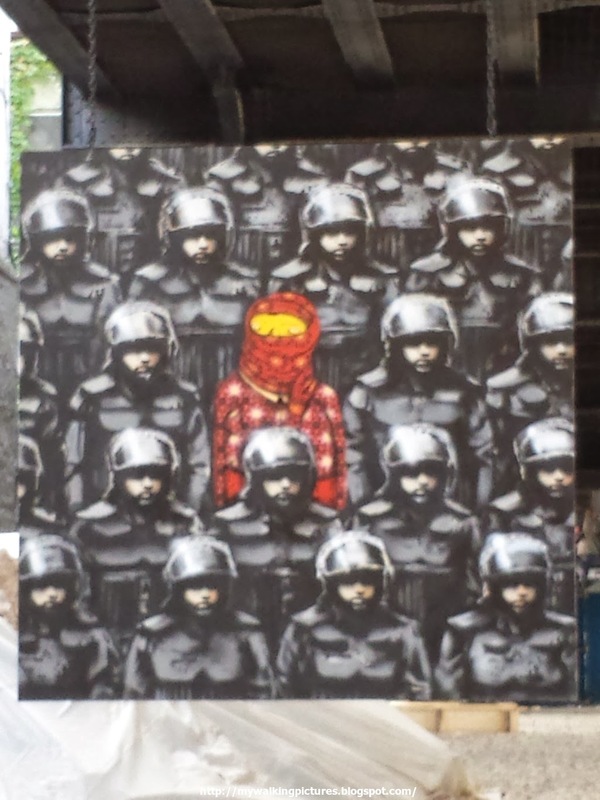 The pic on the left is a Banksy with an Os Gemeos figure at the center. The other one is an Os Gemeos with a figure by Banksy at the center. But that's not all. If you look closely, the figure directly underneath the Banksy is wearing a shirt with a Banksy design, girl with a balloon. 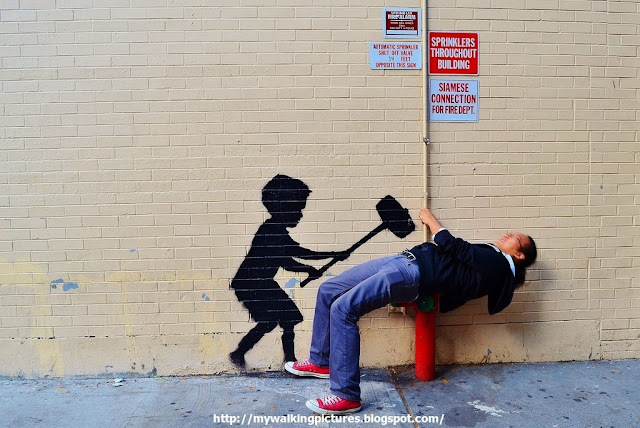 It's a hidden Banksy! 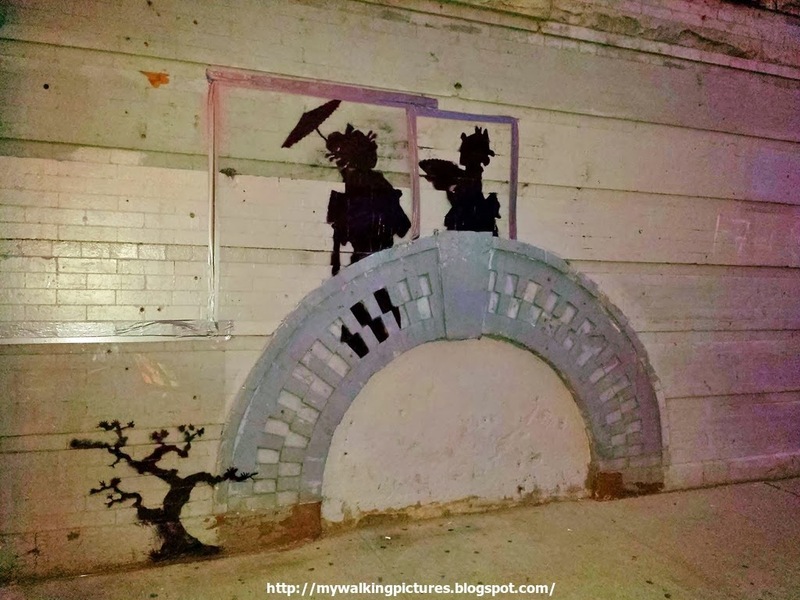 Banksy's piece for Day 19 was in a form of a video and that the piece could be found in Staten Island. I don't think anybody tried to look for it or found exactly where the piece is located. Day 20 was a hammer boy at the Upper West Side, so before going to Central Park for my weekly walk, I dropped by W 79th Street. As usual, there were a lot of people taking pictures of the piece, posing in a lot of different ways. Well, if you want a selfie with a Banksy you have to be creative. Then it's the workweek again and I resigned myself to seeing the pieces in the weekend and hoping they weren't tagged yet or painted over. Day 21 was a stencil art in the South Bronx. Day 22 was a scale replica of the Sphinx in cinderblocks but was taken from the site by some people claiming it as theirs the same day it made an appearance in Queens. Well, there goes my weekend trip to Willets Point. 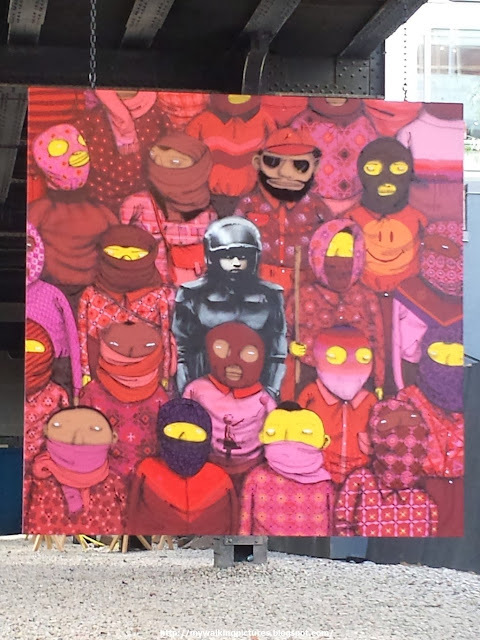 I guess Banksy rested on Day 23 when he posted this: "Today's art has been cancelled due to police activity." 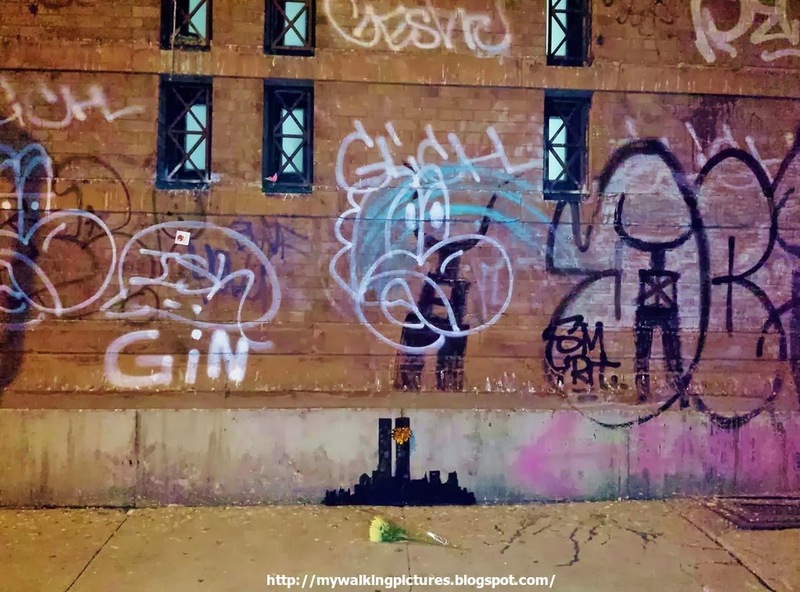 For Day 24, Banksy returned to Manhattan and left a stencil art on the roll up doors of Larry Flynt's Hustler Club along the West Side Highway. I remember this building from a previous walk last summer. Banksy captioned this piece "Waiting in vain... at the door of the club." By the time I arrived in the area, the club management was already talking about the best way to remove the section of the door with the artwork, while some workers at the club managed to pose with the piece. 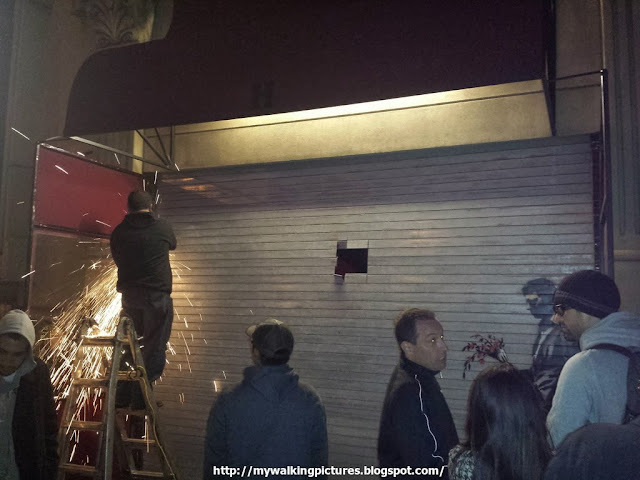 About nearly an hour after I got there, welding work on the roll up door started and eventually, the part with the art work was secured by the club staff. In the morning of Day 25, Banksy posted that he will post the pic and location of his piece around 5 pm. It was nearly 6 pm when he finally posted a pic of the Reaper along with a video featuring Blue Oyster Cult's "(Don't Fear) The Reaper". 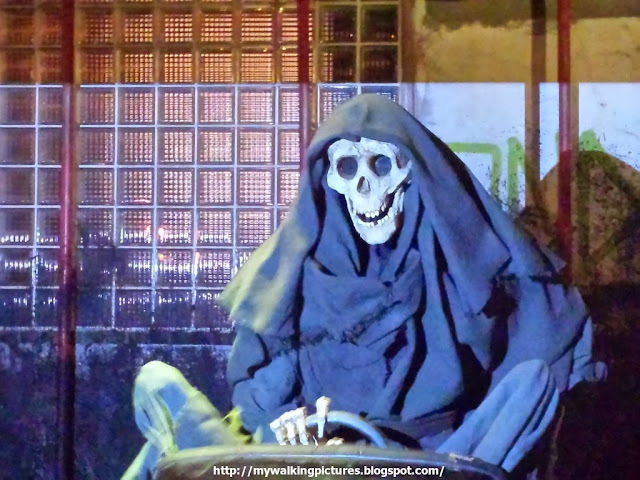 When I got there Mr. Reaper was driving a bumper car to the tune of the Blue Oyster Cult song. The area, at Elizabeth and Houston wasn't that big and Mr. Reaper sometimes had a hard time maneuvering his vehicle. 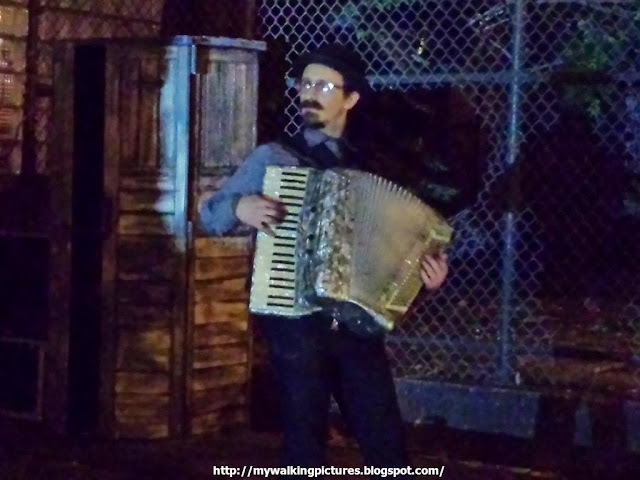 After driving around to the tune of the reaper song, the music would switch to live music played by Mr. Accordion Player so the Reaper could slow down for a bit. Very entertaining, as much as the crowd was that night. One of the upsides of going to the Banksy Reaper show was passing by the Hurricane Sandy-themed Bowery mural, which was finished that night. The mural is by Swoon who joined forces with teens from affected communities to work on the project. 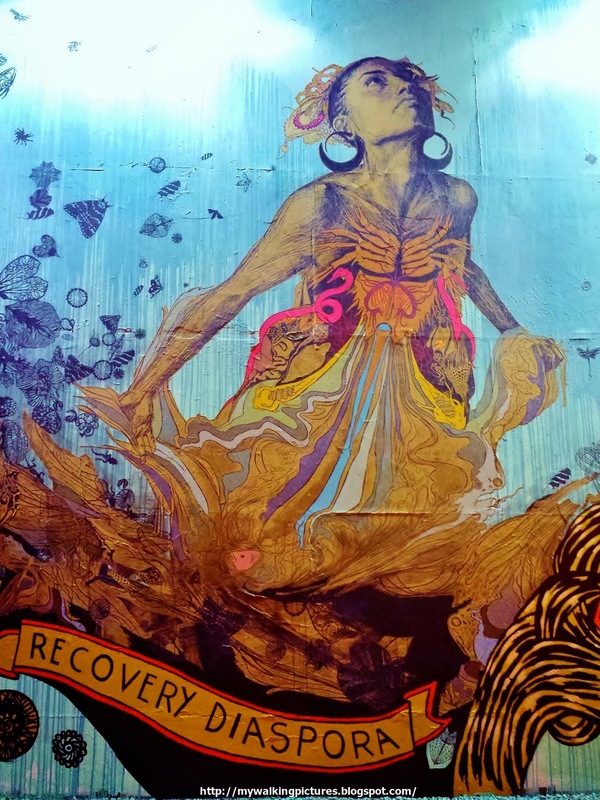 In the center of the mural appears the Greek goddess Thalassa, a familiar image in Swoon's work. When the weekend came, I made it a point to go to the Day 21 piece in the South Bronx. The piece featured a butler bringing a boy spray cans, and the words "Ghetto 4 Life." Five days after the piece came out, it was now covered by four panels of plexiglass. With the plexiglass in place, the art work has been preserved, but at the same time, I cannot get a decent picture. Anywhere I position myself, the buildings across the site were always reflected on my pic. That was a little bit frustrating. 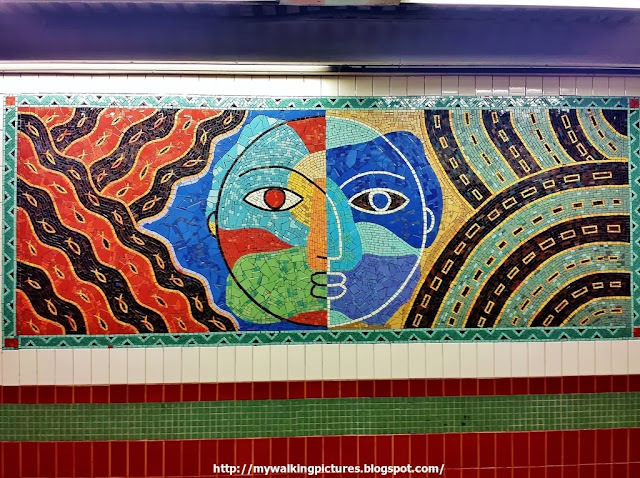 At least the nearest subway station at 3rd Ave/149th Street has a great set of subway art. 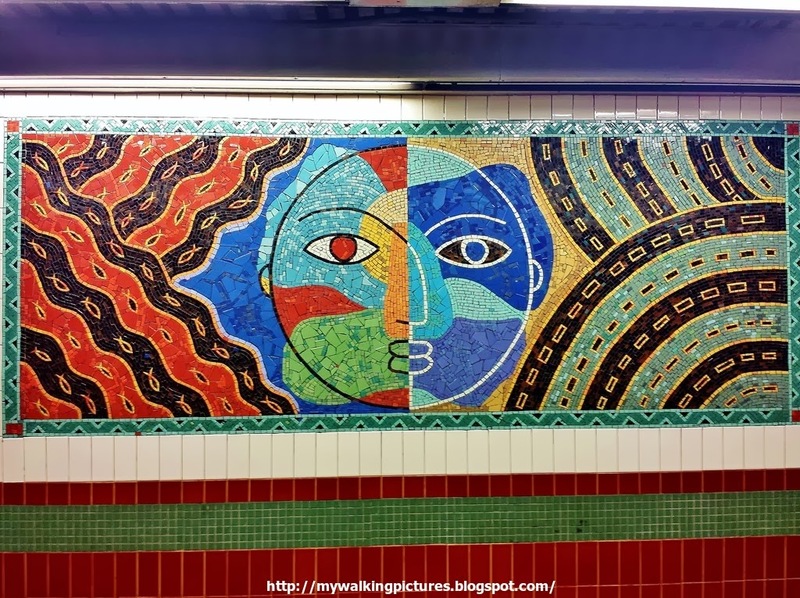 The tile mosaics are by José Ortega and is called Una Raza, Un Mundo, Universo (One Race, One World, One Universe). Here's one of the panels. Banksy's piece that Saturday was an "alternative New York bumper slogan" on a truck somewhere in Sunset Park but I didn't go out to look for it. Instead I spent the day walking in Central Park and enjoying the peaking fall foliage. 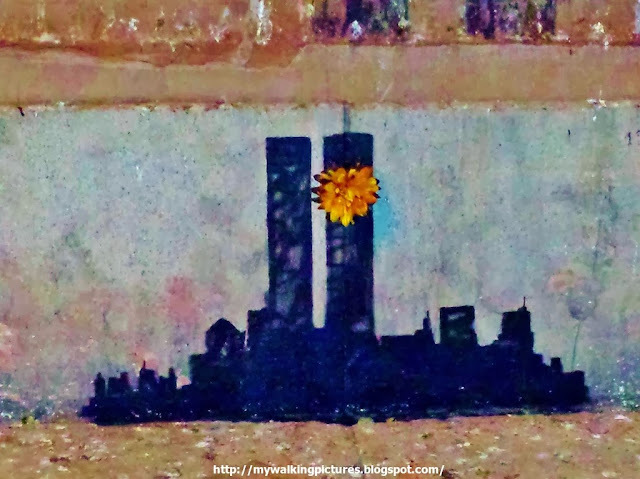 Day 27 was a graffiti in Greenpoint which, according to Banksy, was a response to a rejected NY Times editorial he wrote about One World Trade Center. I wasn't able to go to this site either, as I was with Untapped Cities for a scavenger hunt along Prospect Park/Park Slope/Gowanus area using Google glass. 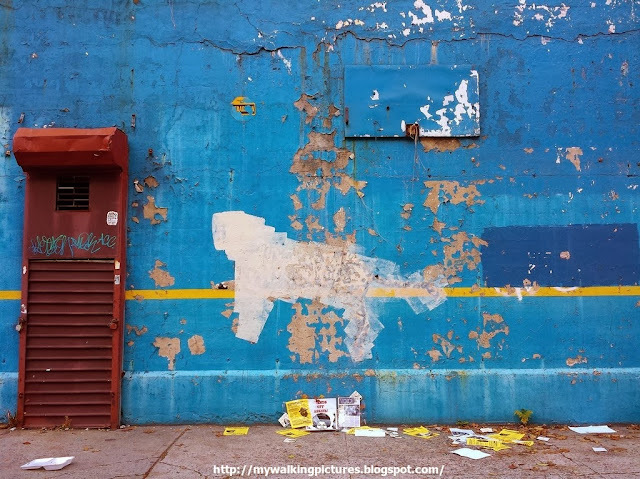 A robot and a barcode appeared in Coney Island on Day 28. I think this is now covered with plexiglass. Housing Works, an organization with a mission "to end the dual crises of homelessness and AIDS through relentless advocacy, the provision of lifesaving services, and entrepreneurial businesses that sustain our efforts" was the recipient of a Banksy on Day 29. 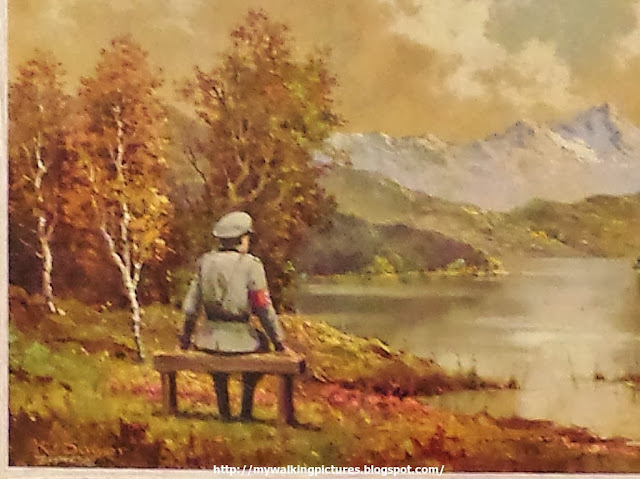 Banksy bought a painting from the store and painted a Nazi soldier on the oil painting. He wrote: "A thrift store painting vandalised then re-donated to the thrift store." The painting is originally by K. Sager, and below his signature on the painting is Banksy's. The piece, which Banksy called 'The Banality of the Banality of Evil' went up for auction to benefit Housing Works at Bidding for Good. Starting bid was $74,000 and the bid ended at $615,000. However, word came out last week that the winning bidder failed to make good on the winning offer for the unique Banksy work. The painting was ultimately sold to someone, although Housing Work declined to disclose its final price or the name of the buyer out of respect for the person's privacy. Banksy posted the photo of his Day 30 piece almost past 6 pm and I was already on my way home. It was a big cat located across the Yankee Stadium. I was able to visit the area three days later and this was all that remained of the piece. That was sad. 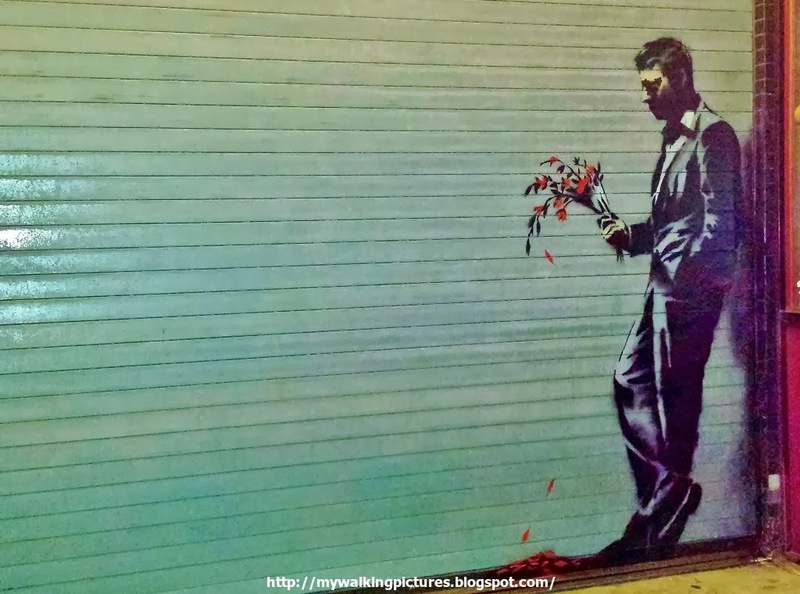 I wish other street artists would leave alone the works of their fellow street artists so that the public can enjoy and appreciate all the art around. 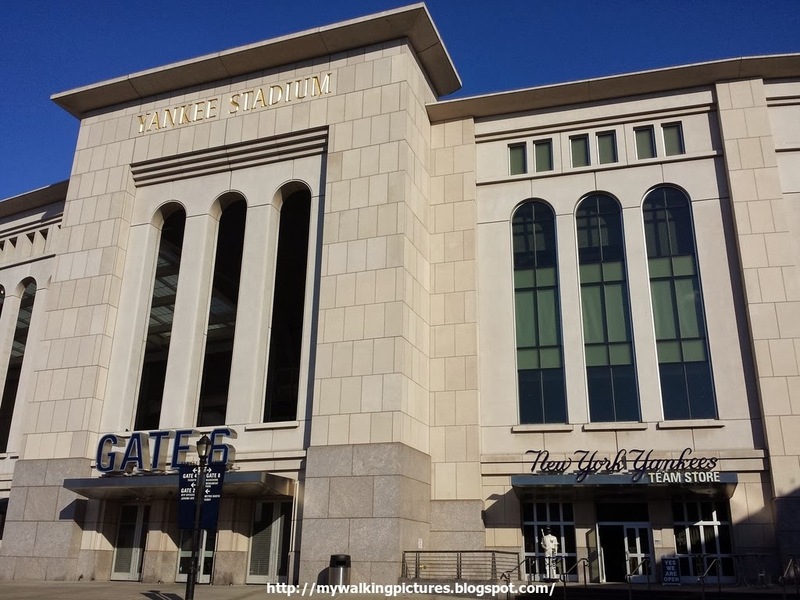 The new Yankee Stadium was a commanding presence across the scarred Banksy cat. Banksy signed off his month-long residency in New York with a set of balloons that read "BANKSY!" The balloons were tied to the side of a warehouse visible from the Long Island Expressway in Queens. Just a few hours later some men tried to take it down and eventually the police took the balloons away for evidence. And there went the last Banksy piece. Thank you Banksy, that was really fun! I was kind of reminded of my hunt for the Sing of Hope pianos last June. And I'm glad Banksy mentioned 5 Pointz. Too bad he didn't do anything about it during his month-long residency. Now, the graffiti mecca in Queens is due to be demolished, probably as early as next month. 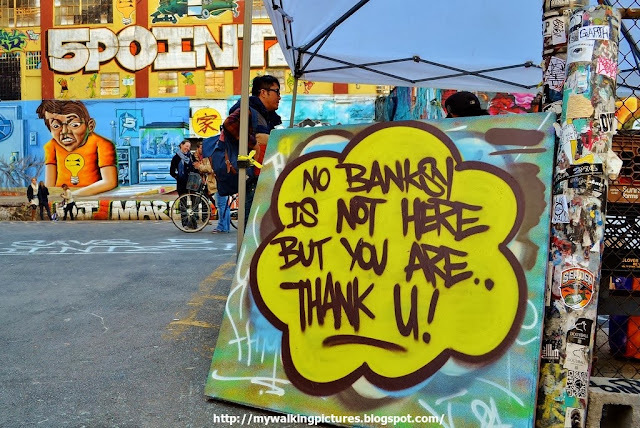 When I was there last month, 5 Pointz had a big sign with regards to Banksy. But whatever the differences between artists, and whatever medium they choose to work with, I have much respect for them. I won some drawing contests in school when I was young and I think my talent was limited to that. Now, i can't draw a straight line so I am always in awe of those who can, and those who make something out of nothing armed with just a pencil, a brush or a spray can .. something worth looking at, or something thought provoking, something that can trigger a spark of conversation, or something that can inspire and make a difference in someone's life. If you want to know what happened to the rest of the Banksy pieces, this link has a great article on the current status of the pieces. Hi Karen! Thank you for sharing that article. It was fun last month trying to locate all those Banksy pieces in the city. I'm glad you enjoyed my photos.